Possibly one of the strangest bothies going, if only for being a part of the Queen’s hoose. 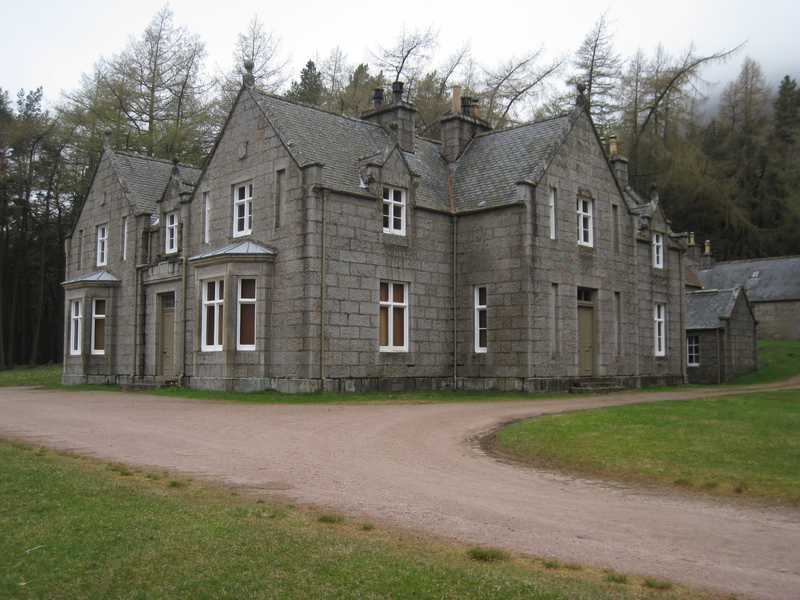 Glas Allt Shiel is an open bothy which is one of the out-houses of the Queen’s holiday home, or picnic lodge towards the west end of Loch Muick. A picturesque situation with a lovely lawn for picnics on a sunny summer’s afternoon! 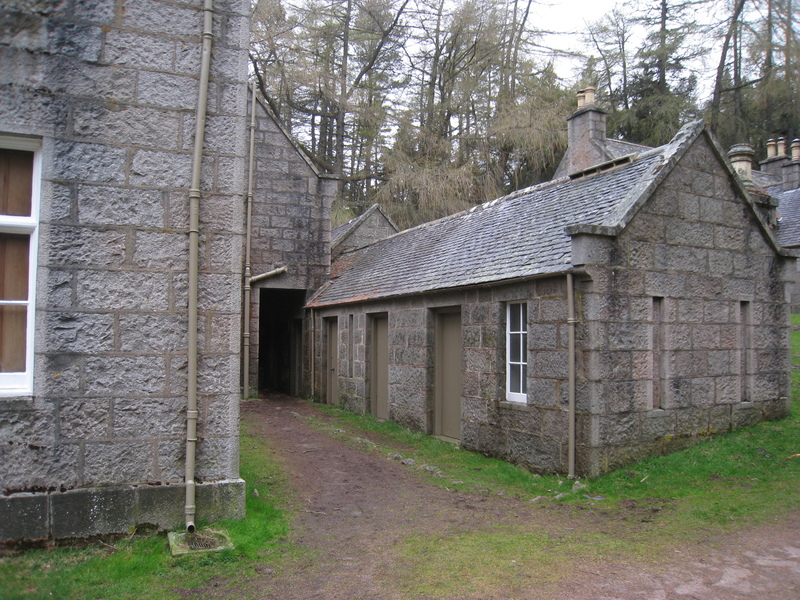 However it came to be the done thing to doss in the Queen’s coal cellar, the big hoose itself is seldom used, so people staying in the bothy have little need to worry about noisy neighbours! When you approach the house up the easily cycleable track from the Loch Muick car park along the north shore of the loch, head towards the back of the house and go into the passageway which leads into a tiny courtyard. The door to the bothy is the furthest in of a row of doors, all the others being locked. The correct door bears a plaque. Inside, Glas Allt Shiel is a bit on the dark side, although it was improved in 2016 following a work party from the Bob Scott’s crew. Previously there was only one window to the outside, away in one corner. But now polycarbonate panels have been put in the ceiling, allowing light to come through from the well lit sleeping accommodation in the attic. It’s still a little on the dim side, but much improved. Some may be a little unnerved at the prospect of stepping on the panels, but they’re easily strong enough to take anyone’s weight and can be walked over with impunity. The bothy is quite spacious by Cairngorm standards, with a large table and a good few chairs. The floor is wooden and although it used to be hard to heat the donation in 2017 of a stove from Bob Scott’s Bothy Association and a project to wood-line and insulate roof and walls, funded and carried out by the MBA have meant a marked improvement. It also has a well-lit sleeping area in the roof space, up a steep flight of steps. This is now also insulated. There are two bunks downstairs, with more sleeping accommodation upstairs. The bothy used to be a legendarily cold doss, but since the donation and installation of a stove by the Friends of Bob Scott’s – since replaced by a newer model, it has become easier to heat. It’s best to take in some coal for fuel, as the estate ask that neither live nor dead wood be collected from the area. There’s a stream just outside the bothy which is safe to use. A branch is channeled with granite blocks and has a few steps leading down to the water. Such are the luxuries of a royal connection. There is another building, behind and separate from the main house. On the uphill side of this there is a small toilet (the door is labelled) which is kept open. This is the usual hole in the ground and flushed by a bucket of water from the burn affair. There is no mobile phone signal at the bothy or in the immediate area. The bothy is normally looked after by Dundee University Rucksack Club, although the recent major renovations were funded by the MBA and carried out by MBA and BSBA volunteers. This page was revised in November 2017. Any idea if the main house is used? If so,, who by and for what? It’s used by HM Queen Elizabeth II and her family. For occasional picnics, I believe. Hi Dave, don’t know what it was used for but I would imagine it was for some form of storage for the ‘big hoose’. When you mentioned ventilation I wondered about a deer larder, but that would be kept well away from the queen’s delicate neb, so I suspect something rather less prone to smelling. The main house is also known locally as The Widow’s House as it was where Queen Victoria retreated for the solitude after the death of Prince Albert. Any estimate of how many it may sleep? Probably as many as you’ll need. From recollection, probably eight or more upstairs and a few more than that downstairs. Haven’t been there for a wee while, so my memory of scale is shaky. I was up there last year and saw HRH out walking her dogs down by the loch. She just looked like someones auld grannie. As for getting there, the bothy is about 5km from the Spital of Glen Muick Car Park along an easy track, and there is a well made path up the back of the bothy to the falls, so you shouldn’t find any great difficulty. Hi, i was wondering if this bothy is ever shut? During winter for instance. A friend of mine said that it was closed when he last visited (in March). If so when are the bothies normally open again for anyone to use? Thanks for your help, i did try and search for an answer but i couldn’t see anything. Sorry if this has already been covered. Not aware of it being shut. It should be open all year round. It may well be that the bothy was briefly closed while some improvements were made: new roof insulation and internal lining, plus some roof repairs I think. It is certainly open again now. Please, please, please take all your refuse/unwanted stuff away with you. There has been lots of junk and rubbish left behind recently. No, I was there while those improvements were being made – https://cairngormwanderer.wordpress.com/2017/05/18/hotting-it-up-at-glas-allt-sheil/ – and it stayed open all that weekend (albeit pretty busy). But I’ll certainly back your comments about rubbish – it’s a real problem there. It’s actually a bit spooky! It is pretty dingy, but if you had a nice fire in the stove and cosy stuff, it might be fine – good that people are improving it! The big house seems sad, like it needs some loving care, there is mould on the wall inside uptairs. The location is stunning. I have been there 7 times in the past as I stay only 50 odd miles from the loch, the main house has only been in use once by the royal family while I was there camping. Me and a group of friends were walking in the dark and pouring rain along the 3.5 mile walk to the bothy from the car park, then all of a sudden 3 black land rovers drive past us and one stopped and some guy got out and told us that royalty were using the main house and to avoid that area. I believe it was Prince Edward as it was his birthday, they were there to get p*ssed and set off fireworks I reckon (even though it was raining). Hi Rachel, yes, the bothy is open all year round. As ever, at peak times you may find it safer to take a tent, but there’s a fair bit of room inside, so there should be room most times. Hi, can I park at the bothy.? Planning to do the White Mounth Munros, so coming from Glasgow the night before. The public road end is at the Loch Muick Car Park, which is about 5 km from the bothy, but it’s a good track, either for walking or taking a bike. Takes about an hour on foot.